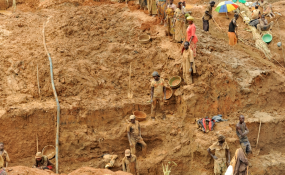 The government of the Democratic Republic of the Congo (DRC) recently announced plans to reintroduce the shelved changes to the country's mining code. The current mining code, introduced in 2002, was based on a draft prepared under the auspices of the World Bank. Its primary objective was to relaunch the industrial mining sector following the Congo Wars of 1996 to 2003 by opening it up to foreign investors. While it has been successful in achieving this goal, the benefits to Congolese people are more difficult to discern. Today the DRC is Africa's largest copper producer and the world's largest cobalt producer. Its mining sector contributes 22% of GDP and 28% of government revenue. Yet the most recent Human Development Report ranks the DRC 176 out of 188 countries, with a life expectancy of 59 and 77% of the population living below the income poverty line. The latest round of changes were originally submitted to parliament in March 2015, but the amendment process was suspended due to collapsed commodity prices and fierce industry opposition. It's now back on the agenda. As in the past a major debate will ensue between the Congolese Government, civil society and the DRC mining industry. The strongest opposition to the proposed changes comes from the large multinational mining corporations, who argue that increasing taxes will hold back the sector's potential. However, a review of the major tax changes reveals them to align with regional standards. The DRC's high operating costs are offset by the equally high quality of its mineral deposits, and the current tax rate exerted over the sector is low. In addition, reviving the reform process presents an opportunity to address a number of concerns related to transparency and local development. increasing royalties from 2% to 3.5% for copper and cobalt. When compared to mining tax regimes in other African countries, the proposed changes do not place the DRC outside of the norm. Most African countries demand a 10% government stake in mining projects. The proposed copper royalty tax is also within the range imposed by many governments in the region, such as Zambia (6%), Ghana (5%) and Tanzania (4%). Likewise, the DRC's proposed profit tax is within the range of other countries, though it sits at the top end. Both Cameroon and Ghana impose the same 35% profit tax as the DRC is considering. But the mining industry's response to these comparisons is twofold. They say the DRC provides an extremely challenging operational environment, with exceptionally high transport and power costs. And they say what matters is not individual tax rates, but the overall tax burden (including both formal and informal taxes). A report published last year by the Natural Resource Governance Institute - which works with governments on natural resource management - shows the DRC's production costs to be extremely favourable compared to regional competitors. In 2013 the average production cost of copper in the DRC was $3,672 per tonne. This same cost was $4,582 in Zambia and $4,931 in South Africa. High quality Congolese mineral deposits appear to offset high operational expenses to generate low production costs (and therefore high profits). Indeed, last year the research firm BMI reported that the DRC will remain a "destination of choice" for mining investors in the coming years due to its low production costs and high quality minerals. The concern about the overall tax rate as opposed to individual tax changes is entirely legitimate. Yet the few non-industry studies that exist suggest this overall rate to be extremely low. Research by Professors Stefaan Marysse and Claudine Tshimanga - prominent political economists working on the DRC - revealed a tax rate of 21% for one of the country's largest copper mines, well below the World Bank's recommended 46% tax rate for the country. Similarly, a recent fiscal study conducted by the German Society for International Cooperation found that between 2011 and 2014, total state revenue collected by the mining sector amounted to a mere 6 percent of total mining sector revenue for the same period. Yet there's a danger that the heated debates about tax rates and royalties will drown out the urgency of addressing other big issues, many of which have been left out of the draft revision. Global Witness - a non profit focused on the links between natural resource exploitation, conflict and poverty - has been calling attention to these omissions. These include the removal of "crucial regulations banning politicians and senior army figures from owning mining rights", an opaque tender process and insufficient beneficial ownership disclosure requirements. In addition, many mining companies have signed "conventions" with the DRC government that exist outside of the tax and legal structure established by the country's mining code. There's no provision within the current draft to address this loophole. Lastly, for a number of years Congolese civil society has been pushing hard for improvements to the code on environmental and local development issues. For example, existing policy provides little guidance on critical issues such as forced displacement. Only three of the mining code's 344 articles refer to the relationship between title holders and people living in title holders' concessions. The DRC's mining code is 15 years old. Extremely advantageous fiscal incentives were included back in 2002 to attract foreign investors to the country. Yet they have minimised the benefits of increased mining production to the Congolese government and people. The proposed tax changes bring the DRC up to date with today's regional standards and should be supported. But when the DRC's parliament reopens in September, its members would do well to incorporate civil society concerns on key transparency, environmental and local development issues. Fail to do so, and Congolese people - particularly those directly affected by mining projects - will be locked into another decade or more of inadequate mining legislation. Change is long overdue, and the opportunity must not be missed. Ben Radley receives funding from The Leverhulme Trust.